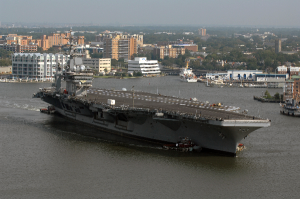 Nestled along the winding coast of the Elizabeth River in Tidewater Virginia, the Norfolk Naval Shipyard goes about its mission of repairing and overhauling US Navy ships and crafts. The shipyard actually exists within the borders of the port town of Portsmouth, Virginia. Originally founded in 1767 as Gosport Shipyard, the operation has undergone its own series of modernizations. Upon the arrival of the Revolutionary War, the shipyard’s owner evacuated, and the property was seized by Virginia. This was the period during which the Norfolk Naval Shipyard was victim to its first arson, at the hands of the British. Later on, both the Confederates and the Union Army would take up shop in this valuable wartime real estate. And both would eventually lend their own torch to the premises. Beyond experiencing three fires and a name change in 1862, to the current name of Norfolk, this shipyard has serviced craft and helped the nation battle through nine major wars. The work done here has always been essential, and the site has been visited by 12 US Presidents in support of this fact. Though the shipyard has extensive ship-building history, one of the first US Navy ships was constructed at the Norfolk Naval Shipyard, its current priorities lie within the scope of upgrading already manufactured ships and craft, both military and private. The Norfolk Naval Shipyard is also home to the world’s first Western Hemisphere drydock, and this historical site continues to be used today. Through executive restructuring, physical occupation, and multiple efforts to destroy the base, its managed to not only recover, but to thrive. 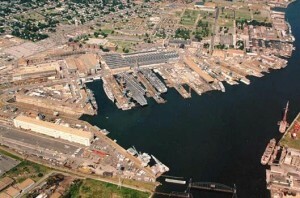 The Norfolk Naval Shipyard currently employs over 8,500 military and civilian personnel and functions as one of the largest shipyards in the world. The Norfolk Naval Shipyard received its misnomer when it was renamed after the most populous city in Virginia at the time, Norfolk. However, this port town’s population began to boom along with its economy. Portsmouth is now worthy of its own homage. Residents can choose from any number of activities without the worry of bridge and tunnel traffic. They also have immediate access to the local Naval Medical Center, providing top quality care and located right in the northeast corner of the city. For families with children, or just the young at heart, the Children’s Museum of Virginia, the largest in the state, features planetarium shows, as well as hands-on exploration of farms, banks, nature, and Portsmouth’s own seaport technology. Recreational activities also exist in abundance. Hit the links on some of Virginia’s top-rated courses. Hook your very own catch of the day from one of Portsmouth’s public piers, or find larger prey by taking an offshore fishing excursion. Enjoy walking trails through one of Portsmouth’s many wildlife preserves or public parks, or simply stroll along the historic seawall. Portsmouth’s seawall runs along the Elizabeth river and provides the unique opportunity to breathe in the true personality of the town. Watch sailboats and submarines float by as you take a moment to wash away the stresses of the day. Portsmouth is a wonderful city for any family. History buffs and outdoorsmen alike can agree that this old-time sea village has both charm and convenience. The same can be said for many of Portsmouth‘s residential neighborhoods. Median Portsmouth Home Values vary, but currently exist around $122,000. Because each area of Portsmouth has its own personality, Portsmouth Homes within the city can vary greatly depending on distance from the water, size, style, and age. One of Portsmouth’s oldest neighborhoods is Olde Towne, established in the 18th century. This area overlooks the Elizabeth River and features stunning Revival style Portsmouth homes in the Greek, Victorian, and Federal types. Because these Portsmouth homes were originally built centuries ago, prices will depend on the particular home’s upkeep. Those that have been fully renovated or converted can easily fetch prices in the $600k’s and above. However, fixer-uppers or smaller, newer Portsmouth homes can be found in the mid-$200k range. Portsmouth Condos in Olde Towne are even more affordable with prices for 2 bedrooms, 2 baths starting at under $100k. Lake Shores is a modern development featuring two-story Portsmouth homes surrounding a man-made lake. Portsmouth homes here are modestly priced, with many 4-bedrooms selling for well under $200k. If you enjoy the peace and quiet of suburb-style living, Lake Shores is sure to please. If you’re looking to make an investment into Portsmouth Waterfront home, there are plenty of opportunities in Portsmouth. The town is surrounded by the Hampton Roads to the North and the Elizabeth River runs through the middle of town and along its eastern border. Natural creeks and lakes have formed as runoff from the river. This means Portsmouth waterfront homes are plentiful in Portsmouth. Homes on Paradise Creek are smaller, generally in the 1,000 sq foot average, but have unbelievable price tags of under $100k. More lavish Portsmouth homes can be found along the Elizabeth River with around 3,500 sq feet going for nearly $400k. However, average Portsmouth waterfront homes along the river can be found with almost 2,000 sq feet in the low $200k’s, often including spacious lots. Portsmouth includes many other neighborhoods, with waterfront property, condominium options, and more. As experts in Norfolk Naval Shipyard & surrounding Portsmouth real estate, let the Stone Team assist you in finding just the right blend of value and luxury for your family. Soldiers and civilians alike can trust the quality service provided by the Stone Team. Though Portsmouth real estate is at at all-time low in the area, Portsmouth’s resilient economy is allowing the market to quickly rebound. 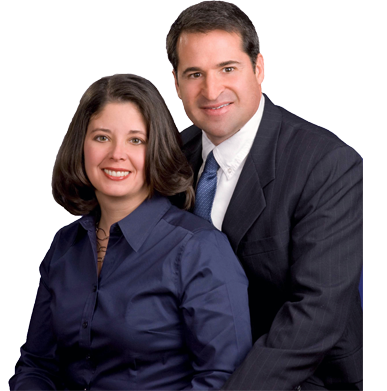 The Stone Team is ready to get started today on helping you and your family find the perfect home in Portsmouth. Don’t risk missing out on your opportunity to live the lifestyle you’ve always pictured. Get started on finding your dream home with the Stone Team today by clicking “home searches” at the top of this page, or by giving us a call at (757)-565-1043. We look forward to helping your family turn their fantasy home into reality!